Perhaps nowhere is a focus on balance more important than in Middle School athletics. Middle School sports prepare athletes for team play at the JV and varsity levels, but they also offer younger students a chance to try new activities and simply have fun. 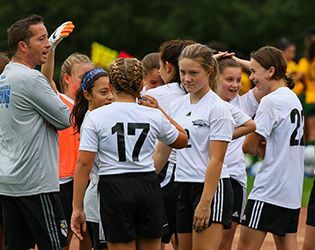 During the summer months, Athletic Director Tim Davis and the Athletics Department worked to enhance both aspects of Middle School sports—bringing greater continuity and structure to team play, while also making sure that youngsters are exposed to a range of activities and have a chance to build skills. "The goal is to build a strong foundation for the future," said Davis. In terms of team competition, Gill now comprises one of 17 schools in a newly-formed middle school consortium: The Private School Athletic Conference. The conference was proposed last spring by Ronald Sansone, director of athletics at Far Hills Country Day School, as a way to bring more uniform scheduling to the schools. Although not an officially-recognized association with bylaws and membership dues, the 17 schools are working together to provide varied and fair schedules for middle schools in the league. The athletes will have a chance to play a greater range of opponents, and the new scheduling will also mean that the team with the best regular-season record earns the designation of conference champion. At Gill, these competitive teams are comprised of students in seventh and eighth grade, with qualified sixth-graders occasionally joining the roster if the numbers warrant. For the most part, however, students in fifth and sixth grade will not commit to a team, but will rotate through different activities, spending about two weeks on each. Under the direction of the school's physical education (PE) instructors and dedicated Middle School coaches, this fall the students will work on developing skills through participation in cross country, field hockey, fitness, football [non-tackle], soccer and tennis. In addition to these initiatives, the Middle School athletic awards for character and sportsmanship are going strong. The awards program was inaugurated last spring by Jonna DeFalco, Middle School health and PE teacher, to pay tribute not simply to athletic achievements but to demonstrations of compassion, encouragement, fair play, inclusion, kindness and team spirit. "It's important that we not only recognize our student-athletes for their extraordinary acts of character and sportsmanship, but that other students become aware of the great things their teammates are doing as well," DeFalco Offered. "We know that good character is contagious, and through role-modeling, students are setting positive examples for one another." The Middle School coaches and PE teachers recognized 30 students last spring; check back in November for a full listing of this fall’s honorees and best of luck to all of our Middle School athletes this season. (Class of 2023) Kate Chen, Nickolas Gattoni, Ryan Getzoff, Clare Janas, Katie Lin, William Stamaton, Daniel Taylor, Tyler Tellalian and Zackary Wendell; (Class of 2022) Anthony Curialle, Joseph Licata, Eideen Mozaffari, Shane Moriarty, Alexander Tulenko and William Strong; (Class of 2021) Lucie Antonius, Matthew Cooper, Brenen Lavoie and Caroline Solondz; (Class of 2020) Harkanwar Chadha, Morgan Champey, Julia Gateman, Grace Hamerschlag, Caitlyn Matthews, Evan Matthews, Adrian Meyers-Massuet, Nicholas Policano, Emily Raia, Lloyd Wright and Lucas Zuanic.